So you're building your brand as a professional dancer. Good for you. That's a step in the right direction towards building your freelance career. As you may already know, aside from talent, you'll also need a strong work ethic, great networking skills, high quality professional materials, and an online presence. With each of these components in place, you can better foster an image that will position you as a working professional. However, when it comes to building your online presence, don't make the same mistake so many solopreneurs make time and again of relying solely on social media platforms to showcase your work. 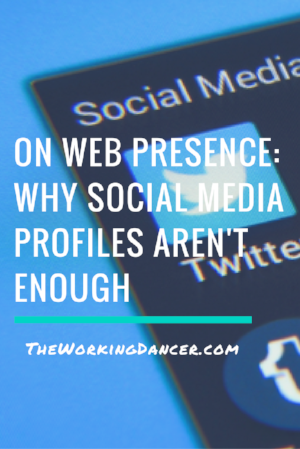 Here's a quick tip on why your web presence needs more than a few social media profiles. While you're singing your heart out to new school covers of "You Don't Own Me", know that on social media, actually, they do. It's YOU who doesn't own your content on social media. All the fabulous pics from dance photoshoots, videos from classes and performances, and all of your other career content is out of your control once you publish it on a social platform. Not only is how the content is used out of your control, but the actual operation of the platform is also out of your control. The popularity of one site could drastically decline at the rise of the next new shiny object, or any one of those sites could, without notice, decide to shut down. If something like that should occur, what happens to the portfolio and image you've spent your time building? What happens to your following? What will you show casting teams who want to see your work online? To have a legitimate web presence that you control, you'll need to create a website of your own. It doesn't need to be lavish or cost you an arm and a leg either. These days, you can create your own professional website, without any coding know-how, for less than $20 a month. All you need is an online space that's dedicated to you, and only you. Use some of the energy you spend on your social media profile to build your own site that showcases your headshots, credits, reels, videos, testimonials, praise from the press, and more. If you're just starting out, a 2-3 page site with your headshot, bio, and contact info will do. While you're at it, resist the temptation to use a free website that leaves the hosting company's branding in the domain name or on your pages. Make the small investment to maintain your professional image and keep the focus on you, where it should be. This post isn't about forgoing social media all together. It's about being smarter in how you use it. Engaging on social media is a wise choice since hundreds of millions of people are active on it daily. It's a great way to further brand yourself and to get the word out about your work. With that, use social media to complement your existing web presence instead of as your only web presence. Take control of your professional image, and use it to help you build the career of your dreams. Ready to get your own website up and running? Visit our 'Career Shop' to learn more about our web design services for dancers. Not ready for that yet? Then click the button below to join the movement, and you'll get weekly dance career tips like this, inspiration, freebies, discounts, and more sent directly to your inbox.